Widely associated with performance enhancers, athletes and hormone replacement therapy, Human Growth Hormone (HGH) has become a household term since the 1980s. Despite its connection to the extreme end of the fitness industry, the effects of HGH have undergone numerous studies and it has since come to be seen as a possible way to slow the aging process, increase muscle growth and metabolic rate because of its anti-aging properties. At age 30, the average adult male begins to see a decline in HGH production, decreasing at a rate of about 2% per year, with low GH levels resulting in slowed metabolism, decreased muscle mass, increased risk of disease, and lower energy. Studies performed suggest that increasing GH to a more optimal level helps reduce body fat, increase energy levels, protect against injury and disease, and increase muscle mass (1, 2, 3). But these same studies all indicate that supplementing synthetic HGH can actually lead to a multitude of side effects. So how can we increase our own HGH production naturally without the nasty side effects of the synthetic versions? It turns out that supplementing l-dopa and arginine have positive effects on the natural production of HGH in our bodies (4), by as much as 221%. 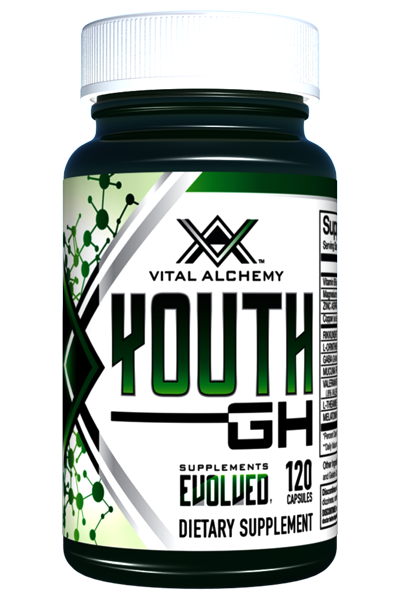 A rumored product (code name “Youth GH”) is set to hit the market in 2018 and is said to provide both of these in addition to other compounds that promote better sleep, as natural HGH production spikes during sleep. Overall, it aims to aid in protein synthesis, body fat reduction, stronger bones and joints, better sleep, and increased muscle mass. Keep your eyes on Strong Supplement Shop to learn more about the results and an expected release date of this potentially age-defying product. That is some very exciting news! Thank you for your comment Nagi. We’re excited to, stay tuned though much much more to come. Thank you for your comment Andy. Stay tuned there is some more news coming that will shake the ground. Thank you for the comment Steve. Youth GH is said to drop in 2018, by the sounds of it you have plenty of time. I hear ya, Steve! I’m turning 58 in January and I’m still outworking most of the kids in the gym. My son is my best training partner (have yet to find another) and he is gaining quickly (although he lives in Florida – and I don’t). Thank you for your comment. Awesome to hear!!! Sound like you guys are trailblazing new horizons for your sons/kids. I don’t think there are too many in their 50s who can say they are still ahead of their sons, but I do know the number is far greater now than a generation ago. Maybe your sons will be saying the same thing when their in their 70’s; its a tribute to you. Keep Trailblazing! I’m looking for something that will help me take myself to the next level. I’m 55 and need all the help I can get, whether it is sleep, recovery, or adding more muscle. Keep me informed as to when this drops. Hey Jackie – Thank you for your comment and request. If you sign up for our email on this site we’ll let you know when the product will be available. The email here is pretty light as sends go and is jam packed with quality info. Hi Max- Thank you for your question. If you are serious I highly suggest you call our Pro Support Line (click the link for contact info). 2. Pro Support is comprised of fellow bodybuilders and athletes who use our products and help thousands (probably more like tens of thousands) of people like yourself. I think the newest person has been on Pro Support for 4 years, so they know their stuff, have basically seen it all and get rave reviews from those who use them. 3. I can’t answer you question here because I know nothing about you like: What are your goals, are you over-weight, do you have any health issues, etc. Pro Support digs into the individual’s requirements and can suggest not only any supplements you might need, but also can suggest diets and workouts. Please Please Please give them a call, you’ll be glad you did and we’ll have a customer for life. Will it make you fail a drug test in a natural completion setting? Hi Russ – Thank you for your question. Its hard to say because every test is different and there is no way for us to know what the specific requirements are for any test you might need to take. I would suggest you get a copy of test requirements and compare them to the ingredients on the label of Youth GH, which will be available on our site soon. The good thing about the manufacturer of Youth GH is that they are very transparent about what is in the compounds and prints each ingredient on the labels. Some other companies do only proprietary blends which don’t always show all the ingredients. I’m 51 and I’m keeping in shape strength training. Its tough when things go down hill as you age . so I’m interested in this product. Hi Jeff – thank you for your comment. Youth GH was released today and in step with other special releases we have a huge Special Introductory Offer Special for the next 72 hours only. Check it out on the site. I would love to try this awesome product sounds legit . How much is it for a bottle ? Hi Bill- Thank you for your comment and question. If you hurry the Special Introductory price is 40% OFF (ends in a few hours) use code: YOUTHGH40. The regular price is $39.95. Where do get this stuff ? Hi Steve- Thank you for your question. You can get Youth GH here. Or there should be a big green button at the top of the post, anyway it was put there when the product was released. Hope this helps you.